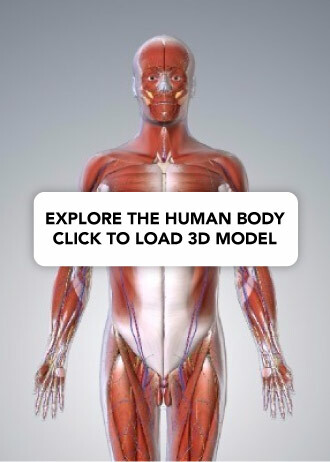 Anatomical terms of movement are used to describe the actions of muscles on the skeleton. Muscles contract to produce movement at joints, and the subsequent movements can be precisely described using the terminology below. As for anatomical terms of location, the terms used assume that the body starts in the anatomical position. Most movements have an opposite movement, otherwise known as an antagonistic movement. The terms are described here in antagonistic pairs for ease of understanding. Fig 1.0 – Flexion and extension. 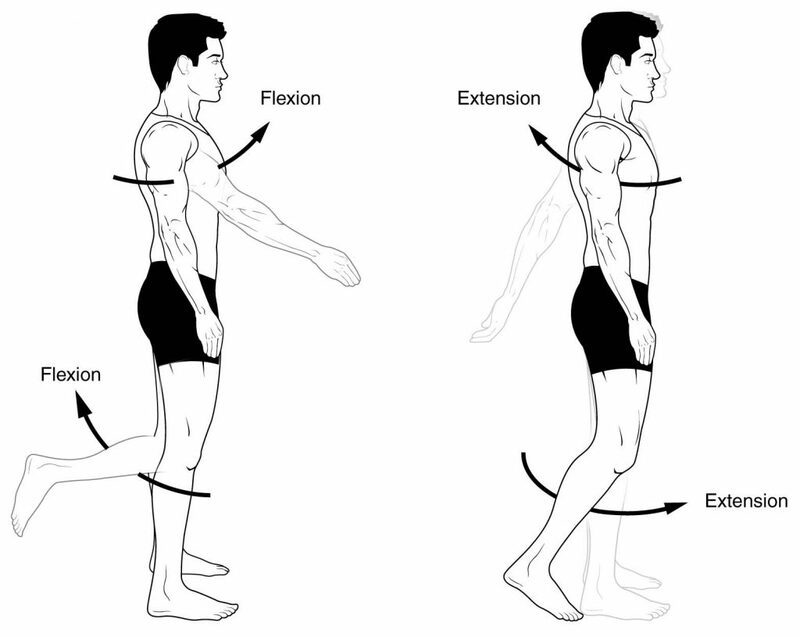 Flexion refers to a movement that decreases the angle between two body parts. Flexion at the elbow is decreasing the angle between the ulna and the humerus. When the knee flexes, the ankle moves closer to the buttock, and the angle between the femur and tibia gets smaller. Extension refers to a movement that increases the angle between two body parts. Extension at the elbow is increasing the angle between the ulna and the humerus. Extension of the knee straightens the lower limb. Abduction and adduction are two terms that are used to describe movements towards or away from the midline of the body. Abduction is a movement away from the midline – just as abducting someone is to take them away. For example, abduction of the shoulder raises the arms out to the sides of the body. Adduction is a movement towards the midline. Adduction of the hip squeezes the legs together. In fingers and toes, the midline used is not the midline of the body, but of the hand and foot respectively. Therefore, abducting the fingers spreads them out. Medial rotation is a rotational movement towards the midline. It is sometimes referred to as internal rotation. To understand this, we have two scenarios to imagine. Firstly, with a straight leg, rotate it to point the toes inward. This is medial rotation of the hip. Secondly, imagine you are carrying a tea tray in front of you, with elbow at 90 degrees. Now rotate the arm, bringing your hand towards your opposite hip (elbow still at 90 degrees). This is internal rotation of the shoulder. Lateral rotation is a rotating movement away from the midline. This is in the opposite direction to the movements described above. 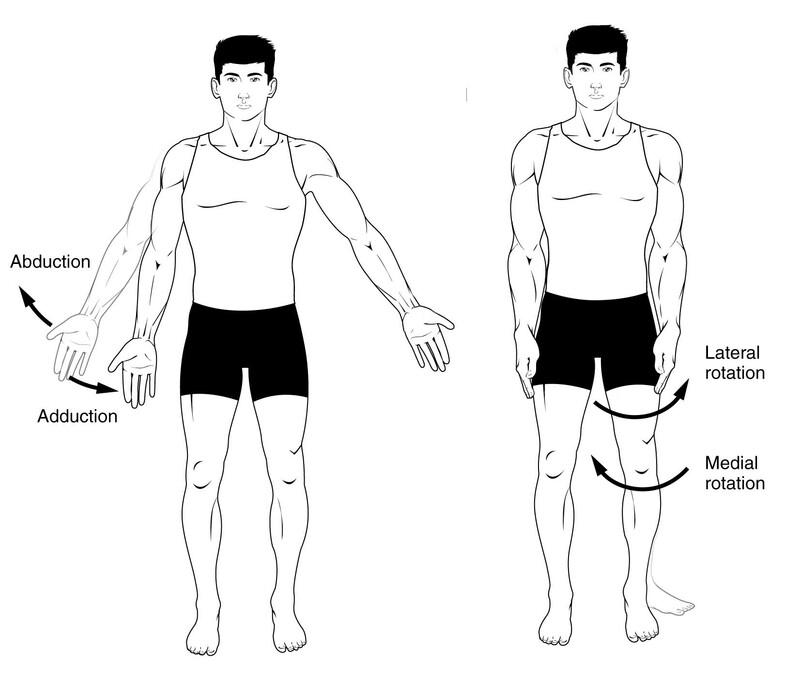 Fig 1.1 – Adduction, abduction and rotation. This is easily confused with medial and lateral rotation, but the difference is subtle. With your hand resting on a table in front of you, and keeping your shoulder and elbow still, turn your hand onto its back, palm up. This is the supine position, and so this movement is supination. Again, keeping the elbow and shoulder still, flip your hand onto its front, palm down. This is the prone position, and so this movement is named pronation. These terms also apply to the whole body – when lying flat on the back, the body is supine. When lying flat on the front, the body is prone. 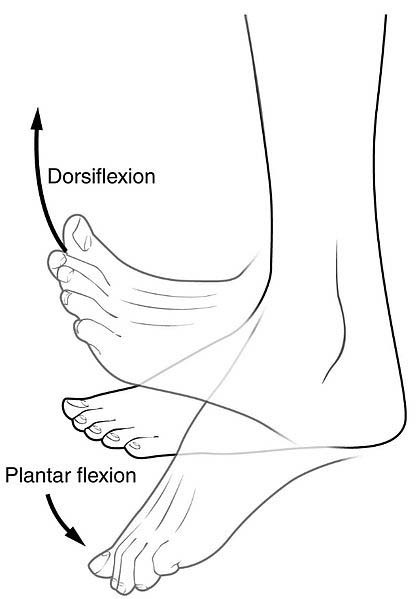 Dorsiflexion and plantarflexion are terms used to describe movements at the ankle. They refer to the two surfaces of the foot; the dorsum (superior surface) and the plantar surface (the sole). Dorsiflexion refers to flexion at the ankle, so that the foot points more superiorly. Dorsiflexion of the hand is a confusing term, and so is rarely used. The dorsum of the hand is the posterior surface, and so movement in that direction is extension. Therefore we can say that dorsiflexion of the wrist is the same as extension. Plantarflexion refers extension at the ankle, so that the foot points inferiorly. Similarly there is a term for the hand, which is palmarflexion. Inversion and eversion are movements which occur at the ankle joint, referring to the rotation of the foot around its long axis. Inversion involves the movement of the sole towards the median plane – so that the sole faces in a medial direction. Eversion involves the movement of the sole away from the median plane – so that the sole faces in a lateral direction. A pair of movements that are limited to humans and some great apes, these terms apply to the additional movements that the hand and thumb can perform in these species. Opposition brings the thumb and little finger together. Reposition is a movement that moves the thumb and the little finger away from each other, effectively reversing opposition. Circumduction can be defined as a conical movement of a limb extending from the joint at which the movement is controlled. It is sometimes talked about as a circular motion, but is more accurately conical due to the ‘cone’ formed by the moving limb. Protraction describes the anterolateral movement of the scapula on the thoracic wall that allows the shoulder to move anteriorly. In practice, this is the movement of ‘reaching out’ to something. Retraction refers to the posteromedial movement of the scapula on the thoracic wall, which causes the shoulder region to move posteriorly i.e. picking something up. Which term refers to a movement that decreases the angle of a joint? Which of the following correctly describes abduction of a joint? Which of the following refers to a movement in a superior direction?